↑ Haynes, K.A., et al. "Engineering bacteria to solve the Burnt Pancake Problem." Journal of Biological Engineering, 2(1), 8, 2008. ↑ Gates, W. and Papadimitriou, C. "Bounds for Sorting by Prefix Reversal." Discrete Mathematics, 27, 47-57, 1979. ↑ Cohen D.S. և Blum, M. "On the problem of sorting burnt pancakes." Discrete Applied Mathematics, 61, 105-120, 1995. Mohammad, H.H. and Hal Sudborough, I. "On the Diameter of the Pancake Network," Journal of Algorithms 25 (1), 67-94, 1997. Roney-Dougal, C. and Vatter, V. "Of pancakes, mice and men," Plus Magazine 54, March 2010. Cut-the-Knot: Flipping pancakes puzzle, including a Java applet for the pancake problem and some discussion. Douglas B. West's "The Pancake Problems"
Joris J. 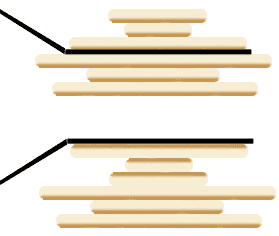 's "Bounds for sorting by prefix reversal"
Animation explaining the bacterial computer that can solve the burnt pancake problem.